Daily News of the SportAccord World Mind Games | Uniting seven federations of the traditional mind sports : Chess, Bridge, Draughts, Go and Xiangqi with over 500 National Associations and close to one billion players. 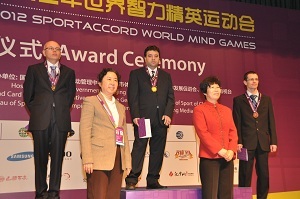 The second edition of the SportAccord World Mind Games is now officially open. Each day you will be able to find here the information of the day, results and photos…. 5 awarding ceremonies have been held. and Women’s Pairs for dramatic content. The Men’s event saw three pairs break clear and the lead changed hands several times. When the dust had settled the Netherlands Bas Drijver took the gold, Joel Wooldridge silver for the USA and Johan Sylvan bronze for Sweden. In the Women’s Championship Great Britain’s Nevena Senior led for the first six rounds. But China’s on the seventh and last she was directly opposed by her nearest challenger, China’s Liping Wang. Two good results put the Chinese player ahead and although she didn’t do so well on the final deal it was enough to keep her ahead of N. Senior. On the second day of blindfold the sole leader of the tournament Levon Aronian made two draws against Peter Leko and Teimour Radjabov and defeated Wang Hao. 5, 5 out of 7 turned to be enough for the first place in the tournament as the closest rival of Levon at that time Hikaru Nakamura failed to win in the last round against Liren Ding and finished the tournament on the second place. 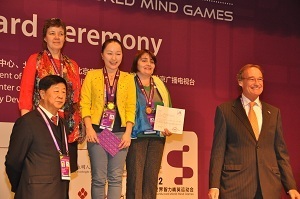 As a result, American player won three silver medals in the Mind Games! Peter Leko had good chances for the medals but lost the last game against American Gata Kamsky. Despite the victory over Hungarian player Gata Kamsky finished behind on tie-break points of Azeri player Shakhriyar Mamedyarov. Alexander Georgiev and Matrena Nogovitsyna from Russia have won the men’s and women’s final of the draughts tournament. Men: Georgiev in his last match against Alexei Chizhov lost with the smallest possible difference and in doing so secured his tournament victory. In the final round of the pair go competition, after an exciting fighting game the Korean pair of Choi Jeong and Choi Chulhan defeated China’s Li He and Jiang Weijie by resignation to add another gold medal to the gold and bronze medals they had already won in individual competition. In a game that lasted 316 moves and was decided by only a fraction of a stone, Mukai Chiaki and Murakawa Daisuke of Japan defeated Joanne Missingham and Lin Chi-han of Chinese Taipei to capture the bronze medal. In the fifth-place playoff, Natalia Kovaleva and Ilya Shikshin of Russia defeated Irene Sha and Bill Lin of Canada by a more comfortable 2-3/4 stones. For the Koreans and Russians, it was sweet revenge for last year, when the Koreans had been unable to defeat the Chinese and the Europeans had been unable to defeat the North Americans. We can only look forward to seeing who takes vengance on whom next year. On the evening of Tuesday 18tt, during the dinner offered by SportAccord, the online tournament winners –from about 385.350 unique players- Leo Lasota (Bridge), Ribhu Ranjan Saha (Junior Bridge), Wu Peinan (Bridge), Diego Sousa (Draughts), Sun Naijing (Go), Song Yongbo (Xiang Qi) were awarded a commemorative medal ,a certificate and a Rado watch for their great performances during SportAccord World Mind Games online tournament. All have been invited for the event here in Beijing and has been able to play with the champions. No medal ceremony today, as the competitions will end tomorrow and there will be 5 awarding ceremony on the last day of the event. It was a most dramatic finishes imaginable on both Men’s and Women’s pairs events. In the Men’s event the Netherlands S. de Wijs and B. Muller overtook the pair who had been leading the event for the whole of the last session, Sweden’s P. Bertheau and PO Cullin on the very last of 88 deals to capture their second gold medal of the games. Meanwhile a strong finish by China’s Zhong Fu and Miao Shi saw them tie with the Swedes and they both earn silver medal. It was no less dramatic in the Women’s event, as it appears that China Ming Sun and Hogli Wang and France B. Cronier and S. Willard had tied for the gold medals. An exact tie in a Pairs event is unprecedented. However a small scoring error was discovered and that meant gold for China and silver for France. The Bronze medals are also going back to France thanks to D. Gaviard and V. Rees. The Children has been able to play with Michael Redmond (9-dan) and some others players. The winners of the Bridge Tournament on line Leo Lasota (USA), Ribhu Ranjan Saha (Junior from India) and Wu Peinan (China), played a match with Bridge champions. Bridge, Draughts and Xiang Qi visit Thsinghua University. The delegation of the 3 sports together with SportAccord Officials paid a visit to Beijing’s Thsinghua University. Students of Thsinghua University in Beijing in anticipation of the SportAccord World Mind Games had been studying the Mind Sports and played competitions to measure their progress. The prize winners of these competitions in the gymnasium of the University received their award from the President of the IFs. The students were able to play with the champions of their discipline. The opportunity was used by Draughts ambassador and tenfold world champions Alexei Chizhov from Russia to give a simultaneous game against 20 draughts fans. He was joined by Asian Champion Dul Erdenebileg from Mongolia and grandmaster Yuri Anikieiev from Ukraine. In the game that decided the gold medal in the women’s individual competition, China’s Li He beat her countrywoman Rui Naiwei for a second time, proving that she has supplanted Rui as the world’s top woman player. Both Li and Rui had beaten Korea’s Choi Jeong, the bronze medalist, in the earlier rounds. In the Men’s competition, the gold medalist is Korea’Choi Chulhan, who emerged victorious over countryman Kang Donyoon in a game that featured wild fighting and huge exchanges. Online Go winner Sun Nanjing plays against Michael Redmond (9Dan). Sun won by playing on the Pandanet gaming platform. The fourth day of competitions ended with medals for Open and Women’s Bridge Team and Women and Men Chess Blitz competitions. After three days of competition the Bridge Team event ended, and the first medals was awarded. The women’s final produced a number of outstanding deals, with France getting more of them right than USA to secure the golf medals. The Bronze went to Great Britain after a nail biting match against China. Men: In, the last decisive round of the men’s competition Hiraku Nakamura and Laurent Fressinet defeated two Russian GMs Alexander Morozevich and Sergey Karjakin respectively while Liren Ding lost against Alexander Grischuk. In the 7th round E. Paehtz was paired with H. Koneru. German player made a decisive mistake 28.Rf4, lost the game and eventually finished on the 5th place. A. Stefanova had good chances to win playing white against K. Lahno but in the end blundered the long move of Black’s queen 51.Qh8 and had to resign immediately. .As a result, Ukrainian GM K. Lahno became the winner of the rapid. H. Yifan got the Silver medal and H. Koneru got bronze. A. Muzychuck, who shared the first place, left without a medal because of tie-break point. A group of school children from Beijing elementary school came to the venue to meet the representatives from the World Bridge Federation. The children could watch the games and play themselves. During the SportAccord World Games, there are Social Cultural and Educational programme. Visits of schools are part of it. On the 13th there are 2 visits: one for Bridge, one for Chess. Bridge players Fu Zhong, Jan Peter Bertheau, Bridge Ambassador Sjoert Brink, one line Tournament winners Leo LaSota, Ribju Ranjan and some officials visited the middle school N° 15. The students could plays with the visitors and get lessons from the Masters. On the 12th morning a press conference took place in the Information Office of Beijing Municipality. Representative of SportAccord World Mind Games as well as the Olympic Development Association presented the concept of Sport Accord World Mind Games and explained why Beijing is an ideal place to host the event. The Opening Ceremony took place in the evening. SportAccord President Hein Verbruggen expressed his gratitude for the warm reception that SA had in Beijing. He continued by acknowledging the sponsors, the LOC and all the people involved in the preparations. Acting Mayor of Beijing Wang Anshun, Vice-Mayor of Beijing Lu Wei, Deputy Director of General Administration of Sports of China Feng Jianzhong welcomed everybody there. The addresses were followed by artistic performances of sand painting, martial arts dance performance, sculpture dance and Peking Opera.